We thank CleanRroom Technology for the permission granted to use this article printed on the January/February 2010 issue. Cleanroom Technology is the European Journal of Contamination Control. Comercer, of Italy, is marketing an automatic glove tester designed to meet the latest GMP Annex 1 needs. «Monitoring should be carried out routinely and should include frequent leak testing of the isolator and glove/sleeve system». The AGT automatic glove tester has all the features that make testing a simple and complete operation. It can be used to test glove integrity in conformity with the pressure decay method ISO 14644-7 Annex E.5 (test in positive pressure). 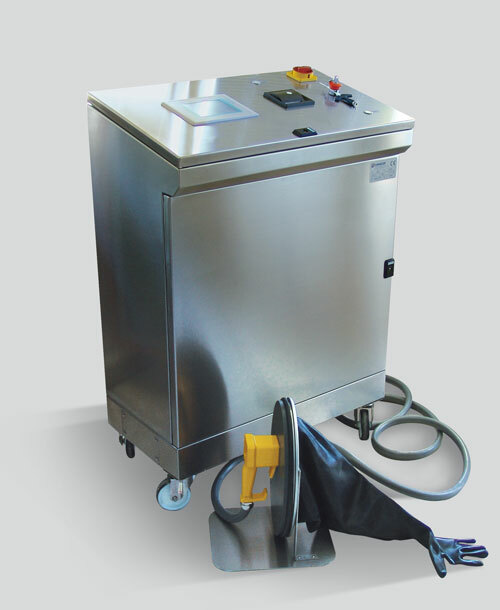 It can also perform the leak test of an isolator chamber/glove box through a flange (or cover) equipped with a differential pressure transmitter and a temperature sensor, supplied with the equipment. Standard features also include an integrated thermal printer and touch-panel. The system can be equipped with one to three glove test modules. Each module can test four gloves, enabling a maximum 12 of gloves to be tested simultaneously.